This is my third post on organizing a creative space for my kids. If you missed my first post on organizing a kids’ craft bar, be sure to go back so you can appreciate the disaster that it was. And check out my second post in the series to see how the mess of reorganizing craft supplies gets worse before it gets better! First, a big thank-you for the suggestions on carrying out the soda shop theme in my kids’ craft area. Your comments have given me some great ideas for labels and artwork around the craft bar. I can’t wait to implement them! I had hoped that I would have all the labels done for this post. But, between the kids actually using the craft bar to make valentines and having a 4-day weekend, this wasn’t feasible. That’s fine by me! The fact that we were able to use this space to do actual crafting and not leave behind a horrible mess has me in complete celebration mode. The first thing I’m celebrating is this amazing idea that Aby gave me. I mentioned in my first post how often times my girls are called away from their projects before they’re complete, and as a result the bar top stays covered in unfinished crafts. So much visual clutter! Aby suggested we get some trays that the girls could use to tote supplies from behind the bar to their work space, and also that could hold any of their unfinished projects in between craft sessions. When my husband put the shelves in behind the bar for me, I was ecstatic to find they were perfectly sized for my favorite trays from IKEA. I’m also celebrating because Aby helped me identify one of the main reasons the girls didn’t like using the craft bar. It turns out that the old bar stools were very uncomfortable to sit on. Huh. Who knew?? I absolutely hated the way they looked, so I was more than happy to have added reason to invest in other seating. 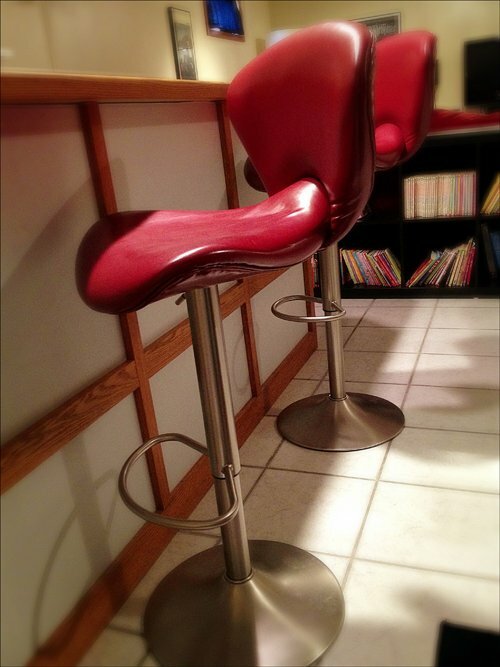 Naturally chrome and red bar stools were the first thing that came to my mind given my soda shop love. They definitely do carry out the theme, but they don’t exactly work with the rest of the basement space. Our other furniture is more modern, and our couch is red but not the Coca-Cola red of diner stools. So, when we spotted these and found them to be within budget, it was a no-brainer. Now that the space is assembled and we are actually using it, getting the labels done is a big priority. Then, it’s time for decorating. I’m playing around with the idea of making subway art with the girls. Have you tried making subway art? If you’ve found any tutorials out there that you tried and loved, would you please link it for me below? Thank you! I love those bar stools, Jen! They are perfect for your craft bar theme! Thanks, Aby! I think they are going to get plenty of use today. Snow day = craft day! i love those bar stools as well. 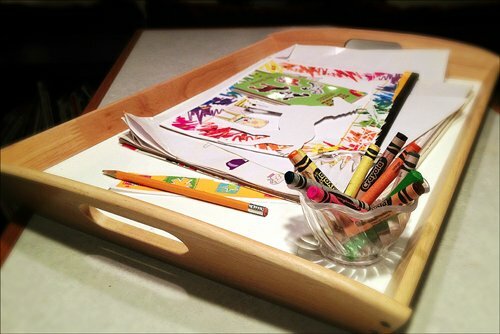 GREAT idea on the trays for unfinished projects – might have to try that myself! Thank you, SuzieQ. I hope the trays work for you as well as they are for us!